Click here to contact the bookings team if dates show availability but you can't book them. Sorry, there are no results based on your selection. 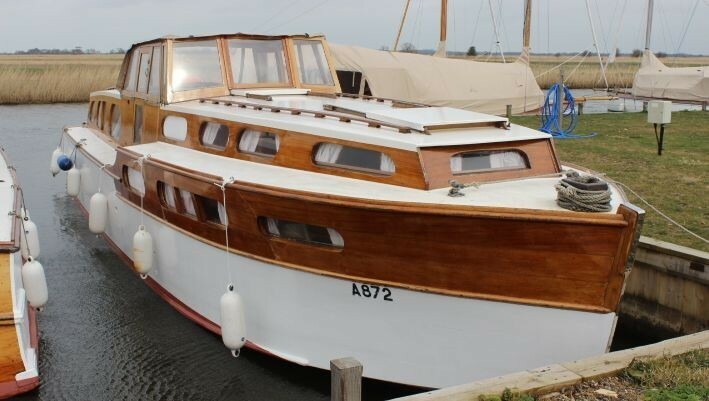 Built by ourselves in the 1950's, the Martham Boat Building & Development Company have been letting these fine traditional wooden Broads cruisers for over 60 years. In this time, they have given many Broads lovers and holiday makers a fantastic experience of the waterways and surrounding Broadland beauty. The Juliette class is the second largest cruiser built by Martham Boats at 39 feet. She is constructed of mahogany on oak frames, with beautiful mahogany bright work. The sweeping lines of the Juliette class means she is one of the most stunning and recognisable cruisers on the Broads. Retaining a lot of her original features, she defiantly stands out from the crowd. Being a 7 berth, she is an ideal family cruiser with excellent accommodation and plenty of space. She is well equipped and has an under counter fridge, gas cooker and hob, warm air Webasto heater, shower and two flush toilets, one of which is en-suite to the master cabin in the rear. From the raised driving position amidships, the Juliette class cruiser is easy to handle and manoeuvre, also offering an excellent vantage point to take in the beautiful Broads, wildlife and countryside. Length 39ft (10.36m). Beam 10ft (3.14m). Headroom 6ft (1.83m) . Martham Boats provide all bedding on-board the motor cruiser which will consist of a duvet, sheet plus two pillows and pillow cases per person. Also provided are two tea towels, a dish cloth and a floor cloth, plus a box of matches and a toilet roll. The galley comes fully equipped with pots, pans, cutlery and crockery. There will be enough place settings for 9 people on-board. Life jackets are also included in the hire unless you wish to bring your own.